You are unique. So when a part of you becomes affected by arthritis, you want a solution that's just for you. That's why Biomet offers SignatureT Personalized Patient Care, utilizing MRI (magnetic resonance imaging) technology to create personalized positioning guides for total knee replacement. These guides use advanced technology to help surgeons more accurately position total knee implants. The goal is to provide a more comfortable, longer lasting implant solution. SignatureT Personalized Patient Care PhotoThe SignatureT system utilizes custom femoral (thighbone) and tibial (shinbone) positioning guides that fit directly onto your unique anatomy. These guides position the implants without having to use traditional invasive instrumentation, allowing for a potentially less invasive procedure. The SignatureT guides are developed from MRI. The MRI is used in conjunction with a computer program to create a three-dimensional joint reconstruction, enabling the surgeon to plan total knee replacement before surgery. In the past, surgical planning has typically been based off of two-dimensional X-rays. With the MRI and SignatureT personalized positioning guides, surgeons have access to a greater level of detail and precision for implant position and alignment before the procedure. This allows for personalized implant positioning and may help enhance surgical efficiency. 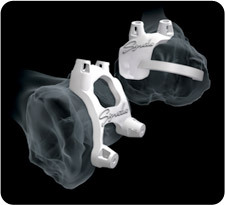 When used in conjunction with the SignatureT system, the Vanguard® Complete Knee System from Biomet allows orthopedic surgeons to provide more of a custom fit specifically for you, regardless of race, size, or gender. The Vanguard® knee offers twice the femoral size options of other knee systems, which allows for 90 different size combinations.